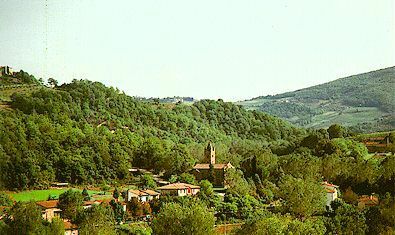 The tiny village of Lucarelli consists of the church of San Martino, a few houses, a restaurant and the Ristoro a Lucarelli Restaurant and Bed & Breakfast Accommodations located along the road joining the scenic Via Chiantigiana highway with Radda in Chianti, Volpaia and Gaiole in Chianti. This strategic location makes Lucarelli a perfect place to stay in a tranquil corner of the Chianti Classico wine territory of Tuscany and a great base for your Chianti wine tour or a trip along one of the Chianti castles routes! Bicycle tourists in particular, not wanting to stray too far off the road, will find the Ristoro a perfect place to eat and spend a night or two. Il Ristoro Lucarelli offers rooms with private shower and refreshments for your journey. Click here for B&B rooms and meals in Lucarelli. In Lucarelli, Il Ristoro Lucarelli offers comfortable single, double and triple B&B rooms and refreshments in a recently restored house dating from 1890. The rooms are furnished in rustic style with their own bathrooms, satellite TV and heating. The same family has provided warm hospitality over four generations - take advantage of it! More about Il Ristoro di Lucarelli. Agriturismo Podere Tegline offers four apartments for 2 to 4 persons (with additional beds for children under 12 at no extra cost) on a winery located in the Chianti castles country near Radda in Chianti and Lucarelli, halfway between Florence and Sienna. Our property is 50 hectares in area, guaranteeing tranquility, and we produce organic wine and olive oil. More about Podere Tegline Tuscany Holiday home. Lucarelli Tourist Information Copyright © ammonet InfoTech 2003 - 2017. All rights reserved.